Updated Friday June 15, 2018 by Bethlehem SC Administrator. 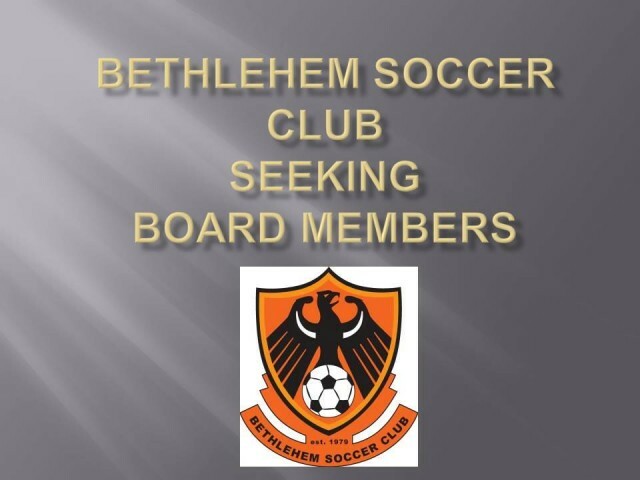 The Bethlehem Soccer Club is currently looking to fill a vacant position on our Board of Directors. Do you know anyone that might be a great board member OR who may know great people for the board? There are numerous rewards associated with serving on our board. You will directly improve the lives of children, improve sports in our region and meet interesting business leaders. Participation is a commitment of time as the organization is in need of the professional and practical expertise provided by its board. A board member is expected to attend monthly meetings, support the organization’s goals, participate in business development activities, and adhere to the bylaws. If you would like more information regarding the duties of the director positions please contact our Club President Dylan Maycrink at president@bscny.org. Interested candidates should submit their resume and cover letter indicating why you would like to be on the board to Beth Pike, the Club Administrator at administrator@bscny.org by June 29, 2018. BSC is a not-for-profit 501(c)(3) organization whose mission is to provide opportunities for youth of all levels to play and enjoy the game of soccer. The goal of the club is to create an environment where players can develop to their fullest potential through volunteer efforts, professional leadership, high quality coaching, and outstanding facilities. The club encourages players to have fun while learning the values of teamwork, sportsmanship and fair play.